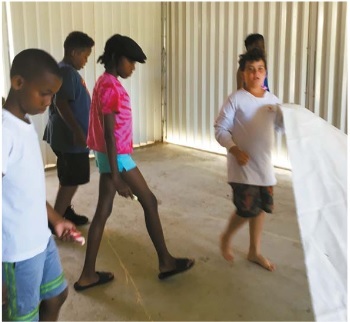 Youth to Adult, “Y2A”, is a series of articles demonstrating the value of Learn to Sail programs for Caribbean children. Learning about many elements of sailboats, sails, and sailing supports the academic work that children are doing in school. A term that is becoming popular, “STEM” — Science, Technology, Engineering, Mathematics — in countries around the world supports and advances applied academics through experiential learning inside and outside the conventional classroom. Sailing is rife with opportunities for supporting this type of academic reinforcement. In St. Thomas, USVI, Margo Lynch tells Y2A, “This year after the hurricanes, I ended up teaching a fifth grade class again. We did several STEM activities in the classroom. However, I knew getting the kids out on the water would be a wonderful way to take the math we had learned and give it some meaning. 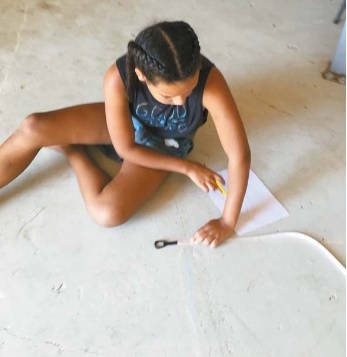 “So we took the fifth grade of the Antilles School to the St. Thomas Yacht Club and had them measure the area and perimeter of Laser sails and worked on basic simple machines (i.e. levers, pulleys, wedges, inclined planes, screws, wheels and axles). In some cases, “machines” are hardware on the boat, in other cases they are found in the design itself. For example, the bow of the boat is a wedge. In addition to identifying those machines on sailboats, we got all of the children out sailing a Hobie Wave. “Paraphrasing from US Sailing’s Reach program on their website: Sailing becomes an educational platform, challenging youth to embrace the marine world, establish a love of learning and explore productive Science, Technology, Engineering and Math STEM)-based careers. Combining educators, sailing instructors, engineers and scientists with today’s youth provides them with a one-of-a-kind authentic learning experience, and gives students the opportunity to apply classroom learning in a cooperative work environment. Bringing the academic angle to Youth Sailing doesn’t have to be limited to STEM. Sailing is entrenched in other subjects, including world history, sociology, environmentalism and physical fitness. After all, throughout mankind’s history, sailing has been employed for exploration and commerce. For young people to understand that “To boldly go where no man has gone before” did not originate with a 1970s television show, children can learn that Captain Cook coined the phrase when he wrote of his sailing exploits in the Pacific Ocean, which was the “outer space” of his time, the 1700s. Bringing the past to life by having a child take tiller and main sheet in hand imagining him or herself at the helm of a schooner is a way to better relate to the colonial period’s primary form of commerce. Piracy has also been romanticized in recent decades and this fascination can fuel a young person’s curiosity for a period in history where seafarers relied on their wit, moxie and limited instruments to thrive and survive in a time when sailing was king, prior to the age of motorization leading to rail and air transport, and then advanced navigational instruments. Richard Bode, in his book First You Must Row a Little Boat, expounded on the many lifelong benefits of experiential learning, such as he had obtained in small boats as a child, first in a row boat and later in a small centerboard sailboat. Bode asserts that his understanding of basics related to seamanship led to his success in dealing with the larger challenges and dilemmas of adult life. He ended his book this way: “I had moved across a continent, migrated to another place and another time, but I had not left the essence of myself behind. I had sailed as a boy, I had sailed as a man, and I was sailing still. “Salient points from Bode’s book include: “But if we want to learn, truly want to learn, we must break through the protective veneer of false pride and allow the masters of the past and present to enter our lives. We need to find those special people who contain the lore of the race and can pass on to us what we yearn to know. They may be individuals we meet personally in the classroom or the shipyard or the office down the hall. Or, they may be individuals we never meet and never can meet because they belong to another age — although we know them well by the works they left behind. “I picked Capt. Harrison Watts, who taught me how to row a little boat and how to climb the wind. I picked Ed Doubrava, who showed me the shortcuts across the shoals and flats and found my first sailboat, a makeshift duck blind, buried in the cattails. I picked Simmy Baker, who taught me how to splice a rope and persuaded me to keep my centerboard lowered at all times. These men were my masters — and I had chosen them; they hadn’t chosen me.”Richard Bode’s description of getting his little sail-boat underway from its mooring is a metaphor for learning and maturation inside or outside the classroom: “Make sure the sheets are free and not tangled or secured, so the boat won’t start sailing in circles around her mooring when you raise the sail. Hoist the sail, raising it as high up the mast as it will go, and let it flutter in the breeze. Drop the centerboard, check the rudder to make sure it’s firmly fixed, and then step back and stare at the boat until she is so indelibly imprinted in your mind that you can see her plainly with your eyes closed. “Think of how the boat will behave when she’s under way, how she will dip and soar. Listen to the sound of the wind in the rigging, the gentle slurping of the hull. Grasp the tiller, feel the subtle pressure of it in your hand — how you move it toward the sail or away from the sail to change your angle to the wind.”Sailing is excellent for reinforcement of standard academic subjects through experiential learning. Ellen Birrell cruises the Caribbean aboard S/V Boldly Go with partner Jim Hutchins. She believes that the financial freedom for her current lifestyle came from learning opportunities she had in youth including sailing. She serves as chair of the Caribbean Sailing Association’s sailing development committee.